It looked like a scene from the Who film Quadrophenia outside the Kerrisdale Arena last Saturday night (June 5). Guys in trenchcoats and military-style jackets stood around with girls wearing button-clad and Union Jack emblazoned overcoats. Inside the Jam, hailed as “England’s #1 rock and roll band” had most of those in attendance “jammed” together on the arena floor. From the very first song, “Happy Together”, a tune off the band’s latest album The Gift, the pulsating mass in front of the stage was exactly that, surging contentedly back and forth in true punk comradeship. Rousing applause greeted the completion of every song, particular affection being shown to the popular single “Town Called Malice”. 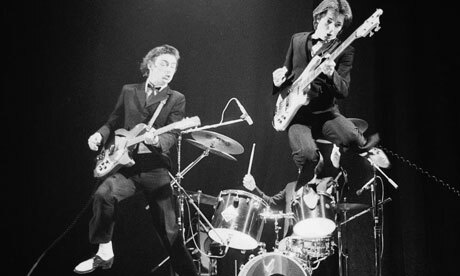 Most of the Jam’s songs are short, two and three minute pieces, but they were long enough to get several of those in the bleachers up to do the familiar “new-wave twist” wherein they keep their feet firmly planted on the ground and swing their arms and hips, bending at the knees in time to the music. Anybody who’se been to the Luv-A-Fair knows the dance routine I’m talking about. But though the Jam played like they meant it, and the audience responded in kind, the concert came off more as a social or cultural event than a musical one. The band’s fast, bopping rock came out so muddled and echoey from the combination of volume and rotten acoustics that, as is usual in the arena, the show turned out to be more something to watch than something to listen to. For instance, as I was leaving the place during the encore, “Trans-Global Express”, I saw a guy outside looking in through the glass, and he was standing there with his fingers in his ears! Good thing Motorhead wasn’t playing this week.